Locally Integrated Menus were a hugely anticipated feature since the introduction of universal menu in earlier Unity. 'Click to Minimize' is a similar functionality asked by many in the community. Well, it has been delivered. The latest iteration of Compiz Config Settings Manager (CCSM) has the Click to Minimize feature in the Launcher settings as an experimental functionality. And it will probably make it as a default Unity Launcher behaviour prior to the release of Ubuntu 14.04 LTS codenamed "Trusty Tahr". 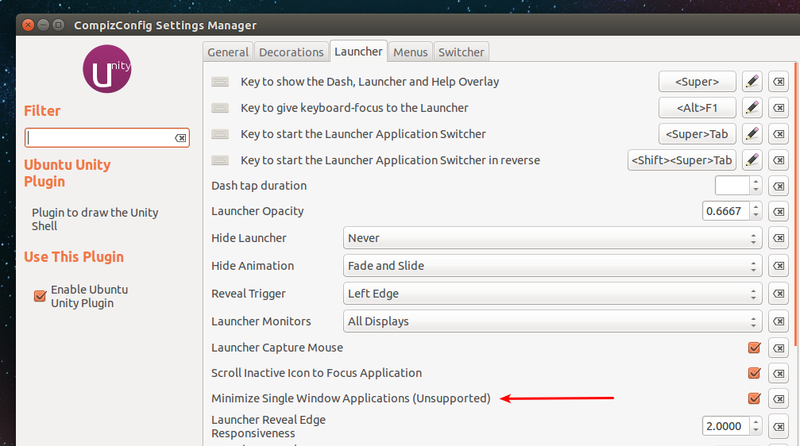 Though not enabled by default, 'Click to Minimize' functionality for Unity Launcher has arrived on Ubuntu 14.04 LTS. Currently, you need to have CCSM installed to enable it. Pretty neat, don't you think? LIMs, new Lock Screen and borderless windows, new Spread animation and now this. Which among these small tweaks do you think will make the maximum impact? Let us know your opinion in the comments below. Thanks for watching.